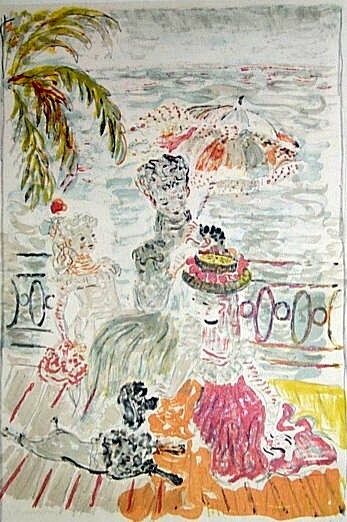 Two ladies with a poodle. Lithograph, 1/60, signed. 20 x 13". Portrait of artist’s daughter Nathalie. 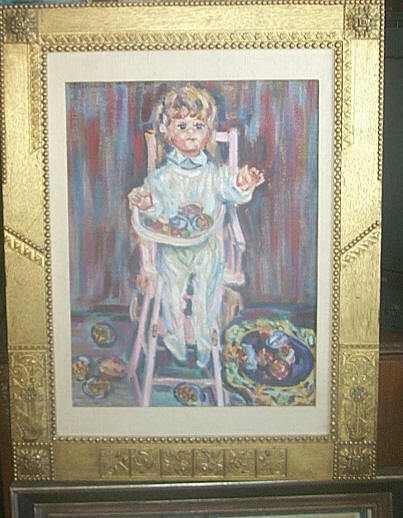 Oil/canvas, signed up left, inscribed “Nathalie, 1944” on the reverse, 19x24 inches. Compare with 1944 photograph of the family illustrated in “Constantine TERECHKOVITCH” by M. Gauthier, Geneva, 1948, p16 and with the slightly later (1946) portrait of Nathalie illustrated in TERECHKOVITCH by George Vigne, Paris, Flammarion, 1972, p32.In original John C. Newcomb (has remains of a label on the back “hereby warrant all the gild-… to be pure Gold Leaf… J. C. Newcomb… Manufacturer Chicago”) Arts and Crafts – Aesthetic Movement gilded wood hand carved and gesso decorated frame 1871-1883 (before Charles Macklin became a partner in the company). Cadet (Soldier in uniform). Oil/canvas, signed low left, 42x 16 inches.